You should buy silver bullion (and take possession of it) as part of your well-diversified portfolio. In this article I assume: You are a "baby boomer." You are not independently wealthy. You don't want to spend a lot of time worrying about financial markets. Counterparty - the "other guy" in a contract or agreement. If you are the buyer in a contract, the seller is the counterparty. If you are the seller in an agreement, the counterparty is the buyer. "Counterparty Risk - risk to each party of a contract that the counterparty will not live up to its contractual obligations. Counterparty risk is a risk to both parties and should be considered when evaluating a contract." Have you ever thought about the counterparty risk of depositing money in a bank? The simplified version of the agreement between you and the bank is, the bank gets the use of your money and you get paid interest on it. Your counterparty risk is that the bank can go out of business or suffer a bank run and not return your money or the interest earned on it. So now, let's think about the counterparty risk when you buy silver bullion and have it in your possession. Guess what? There is NO COUNTERPARTY RISK! Why? Because you have no agreement with anyone. You depend on no one else to keep their agreement. You possess the silver already! 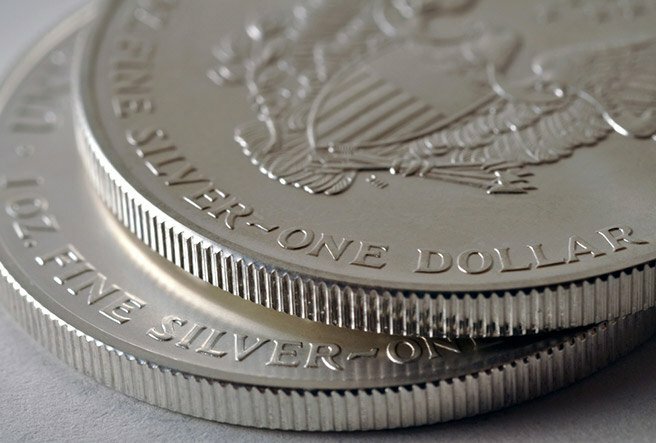 Silver bullion adds a unique type of diversification to your portfolio. Other financial instruments in your portfolio like ETFS, stocks, bonds etc. have counterparty risk - not silver bullion. Silver bullion is not even part the banking system (meaning banks, governments, money, etc). If your bank goes out of business or, heaven forbid, the US dollar becomes worthless, your silver bullion will still have value. Why? Because it has intrinsic value and you can always barter with it. Many articles have and will be written about the long-term supply and demand of silver. For a breakdown of silver supply and demand see this: Understanding the Silver Market. For the purposes of this article, I'll list a few basic reasons why the fluctuations of supply and demand will only get better for the long-term silver bullion owner. There is a finite amount of silver in the world. This has historically been stated as being the reason to buy real estate as an investment. But it is true for silver as well. Silver consumption has exceeded silver production for most of the last thirty years. There are more patents being filed for new uses of silver each year than for all other metals combined. Silver investment demand has climbed 30% this year, Societe Generale said in a report on March 4. Silver is used in technology such as solar panels, cell phones, computers and more. Silver's antibacterial properties are the driving force behind its use in water purification, bandages, wound dressings, catheters and other medical instruments. The major monetary metal in history is silver, not gold. Buy silver bullion for your piece of mind. When you buy bullion you are buying a physical, tangible, metal asset. When you buy silver bullion you acquire an asset that has qualities unlike most of the traditional investments. Don't just blindly follow what someone says about silver bullion investing. Do your own investigation. Do your own "due diligence." If you don't have any physical silver as part of your fully-diversified portfolio, my question for you is, "Why not?" Silver Bullion Dealers - In this article we have an analysis of the top silver bullion dealers on the web. My First Silver Purchase - This is about the first time I bought silver. It's a love story.